Tridacna gigas is the largest mollusk in the world. Learn why it the shells lack luster and more. The following information is from Kunz & Stevenson, pearl experts who were published in 1908. In the shells of some mollusks--as the edible oysters (Ostrea) or the giant clam (Tridacna),--there is almost a total absence of the crumpled corrugated laminae, and, consequently, there is little luster. The giant clam of tropical waters yields a few large opal-white symmetrical pearls, with faint luster and of little value. 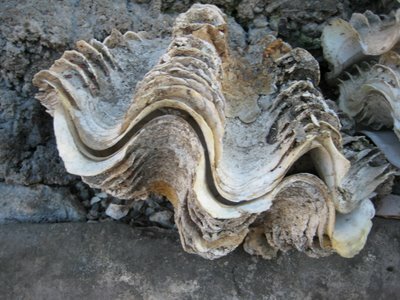 The transversely oval shell of this shell, with its great squamous ribs, is probably the largest and heaviest in existence, single pairs weighing upward of 500 pounds. It is found in tropical seas, and especially in the Indian Ocean. it is much used for ornament, particularly for fountain-basins, and for benitiers, or holy-water fonts. A beautiful pair used as benitiers in the church of the St. Sulpice in Paris is said to have been a gift of the Republic of Venice to Francis I. There seems to be no established fishery for this mollusk, and the pearls very rarely come on the market. About four years ago in New York City an effort was made to market one weighing about 200 grains. A menacing peril of pearl diving is the giant clam, a monster bivalve, whose shell measures two or three feet in diameter, and is firmly anchored to the bottom. This mollusk occurs on many of the Asiatic pearling grounds. Lying with the scalloped edges a foot or more aport, a foot or a hand of the diver may be accidentally inserted. When such a fate befalls a fisherman, the only escape is for him to amputate the member immediately. Once in a while on the pearling shores a native may be found who has been maimed in this manner, but usually the unfortunate man does not escape with his life. Kari's note: I've since read in recent publications, that there is no documented incident as such mentioned above and that these clams close so slowly there is actually little possibility of being caught in one.....Not that I'd like to be the one testing the theory....just in case. It is claimed that the breeding pearls are obtained from several species of mollusks, mostly from the Margaritifera, but also from the giant clam and the Placuna (window shell). 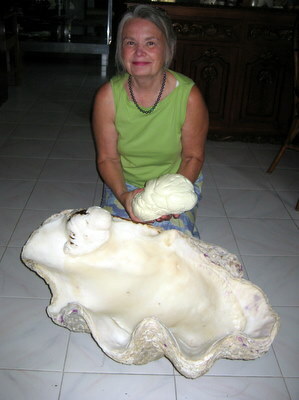 See a large Tridacna pearl. The pearl that holds the world record (Pearl of Allah) for being the largest pearl is from a Tridacan Gigas.